We often wonder how you choose your classes, is it the food or is it the teacher – both options are equally important! So over the coming weeks we are going to introduce you to all our teachers and give you a bit more info on each of them to help you decide whether a class with that particular teacher would suit you! I first met Ursula 15 years ago when we worked together at a cookery school in London. I shall never forget that day and the food we prepared – it was an Italian Christmas Feast! We made bread (with our very own biga to take away) and Rotolo di Maiale (pork tenderloin wrapped in the most delicious pastry!) amongst many other recipes! 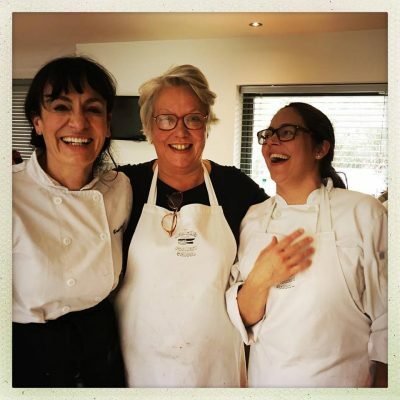 We have remained firm friends ever since and it is testament to Ursula and her love of food as she travels each time from deepest darkest Essex to share her knowledge with you all her in Oxfordshire. Anyone who comes on one of Ursula’s classes feels the same way…. she is a force of nature, passionate, energetic and as one student said “the happiest person she had ever met”. You will leave Ursula’s classes feeling energised and passionate too about what it was you have just spent 3 hours learning about be it bread, pasta or the oh so popular Italian Vegetarian dishes. If you book one class this year book one of Ursula’s to fire up your passion about all things Italian – you won’t be disappointed, I almost want to give a money back guarantee on it! Sunday 6th May – Pasta! Saturday 28th July – Bread! Saturday 1st December – we are still deciding what delights to bring you! !